Captain Stacy delivers some disturbing news to Aunt May and Peter. 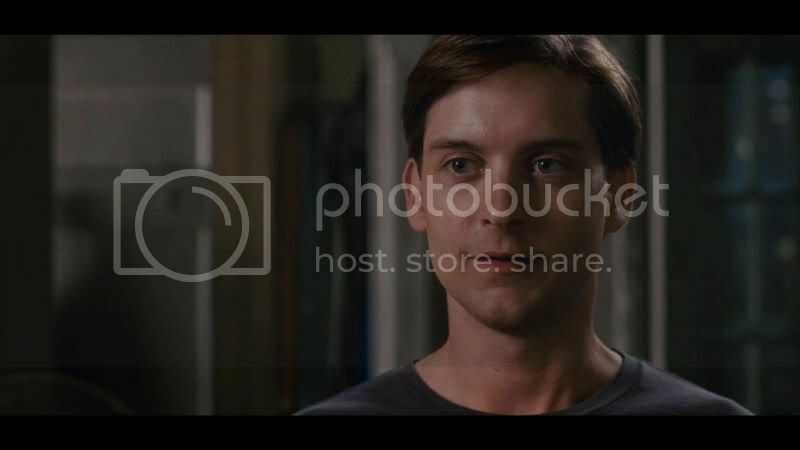 After hearing about his reaction from Aunt May, MJ is worried about Peter. 14 days until Spider-Man 3!! I liked the pics of Peter and May. The pics of Peter and MJ were alright. I have no idea why, but I like Peter on the very last one. Aw no! Don't wack Petey! What the symbiote! Ah, here's where we find out that Marko was behind the death of poor ole Uncle Ben. This is not an idea I am too fond of but it works here. Nice to see Captain Stacy and May looks cool with the beret. MJ does look concerned for Peter especially once she finds out about Uncle Ben. She needs to make Peter understand that revenge is not the answer. It seems to me that revenge is an underlying theme in the film this time around. That will make some good story telling. I'm not too fond of it either, but it did seem to work. Revenge is definitely a theme. Luckily Peter doesn't let it overtake him completely. There's one thing that's calling my attention... what's up with MJ's locket? Did Peter gave it to her or something? Oh and Milkshake!Krueger looks like a beaten puppy in that mug shot. jenn_1 and I were just discussing that the other day - she seems to have it on in almost every scene! It's not in the book... so no idea! Oddly, the scene of may and peter next to each other seems to draw a parallel to that bank scene in spider-man 2, i think? I think you may be right! They look very similar there, don't they? it's just interesting in how i ended up spotting this..instead of someone else..